What does it mean to be from Hartford? What defines the city’s identity? 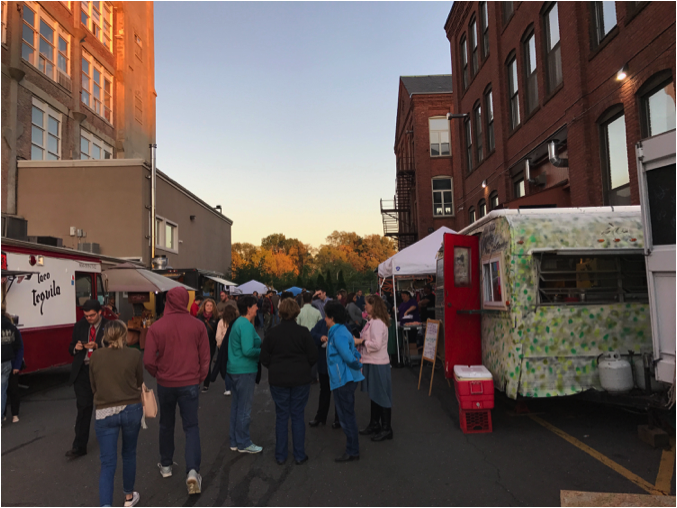 In recent years, Hartford is developing a reputation for its amazing food truck vendors – and this is no accident. Jeff Devereux (Trinity College ’12) is among the founders of the social enterprise Breakfast Lunch & Dinner (BL&D), which holds many events with the goal of fostering “collective culture” in Hartford. One central event is Know Good Market, an open-air food truck event held in Hartford’s Parkville neighborhood on the second Thursday of the month from April to November. 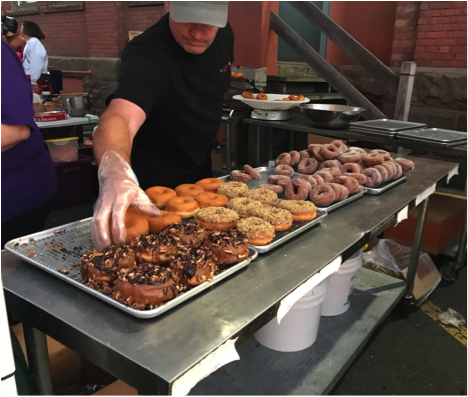 At Know Good Market, residents come together to enjoy food, drink, and local vendors, while also developing a closer attachment to one another and to the city of Hartford. Devereux describes collective culture as a state in which “everyone feels a part of a community, regardless of race, income, or background. …[E]veryone can get involved and participate in something together.” In this way, Devereux’s efforts with Know Good Market are about far more than having fun. Community events that build social networks, trust, and a sense of shared goals can contribute to building upon Hartford’s strengths and addressing its challenges. Since the late 1990s, survey after survey placed Hartford among the poorest of all American cities. As its population shrank, poverty and racial segregation grew. As a result, redevelopment stalled and the city fell into an extended fiscal crisis. Many of the suburbs surrounding Hartford are wealthy, but suburban residents typically come into the city only to work, leaving directly after the workday. Downtown, sidewalks that are packed by day empty out in the evening hours. In part as a result, many recent college graduates leave Hartford for bigger cities. While some view Hartford’s size, poverty, and diversity as a disadvantage, Jeff Devereux sees these challenges as opportunities. Indeed, he believes that the city’s diverse population and relatively small size are both advantages in launching a business like BL&D. Hartford has the components of a great city, but needs a shared sense of identity – a kind of social glue – to bring these ingredients together. Know Good Market fosters collective culture by bringing together people from different parts of Hartford for a shared experience. 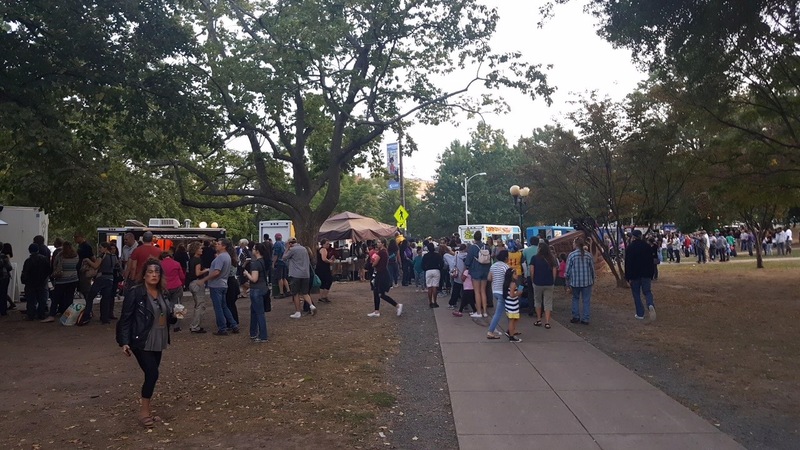 In only its second year, the market has grown from two food trucks and about a hundred people, to twelve vendors and as many as eight hundred people. When we visited on Thursday, October 12, the market was the perfect place for a diverse range of residents to get food and drinks after work. The market had numerous culinary options, and almost all the vendors had lines reaching from their trucks. The lines were a great opportunity to meet new people and start making connections. Another site for interaction is the market’s single, long communal table. With few other places to sit and eat, people can’t help but sit together and meet a new neighbor. 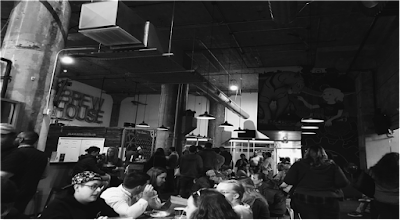 Proximity to Hog River Brewing Company on Bartholomew Avenue also helps build social connections. With beers in hand, strangers felt even more comfortable beginning to interact. Through face to face interactions at Know Good Market, we get to know our neighbors better, we trust them more, and, ultimately, we’re more able to work together to make change. This collective culture makes the city a more attractive place to live and may contribute to combatting “brain drain” and bringing in more tax revenue. So now you might be asking, what you can do to help? The answer is quite simple: attend Know Good Market! Start following BL&D on social media so that you won’t miss upcoming events. 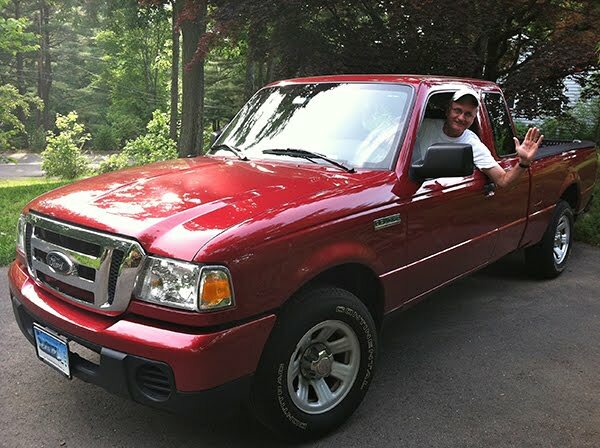 Jeff Devereux plans to continue creating opportunities for the community to connect at Know Good Market and beyond. Going to events hosted by Breakfast Lunch & Dinner is a great opportunity to have fun while becoming a part of the collective culture of our city. This sense of shared identity will become a resource in addressing challenges and capitalizing on opportunities as a greater Hartford community. This article is the fourth and final in a series of four student blog posts featured from Trinity Assistant Professor Abigail Williamson's first-year seminar Civic Engagement and Community as described in my blog post Classroom to Community at Trinity. Mitchell Pfaff (Trinity College ’21) is from Westwood Massachusetts and has a growing interest in politics. Anna Barry (Trinity College ’21) is from Sutton, Massachusetts, and attended Worcester Academy in Worcester, Massachusetts. At Trinity, she is a member of the Equestrian Team and a writer for Trinity's chapter of HerCampus, which is an online magazine for college women. Jack Ricciuti (Roxbury Latin ’17, Trinity College ’21) is a member of the varsity Trinity men’s lacrosse team and intends to major in political science or economics. Karen Taylor doesn’t ever shy away from a debate. When she engaged the mayor of Hartford in a heated conversation about problems with the city’s schools, he walked away so impressed that, soon after, he appointed her to the School Board. In all of her other projects, Karen is equally as focused and energetic about her impact on the Hartford community. 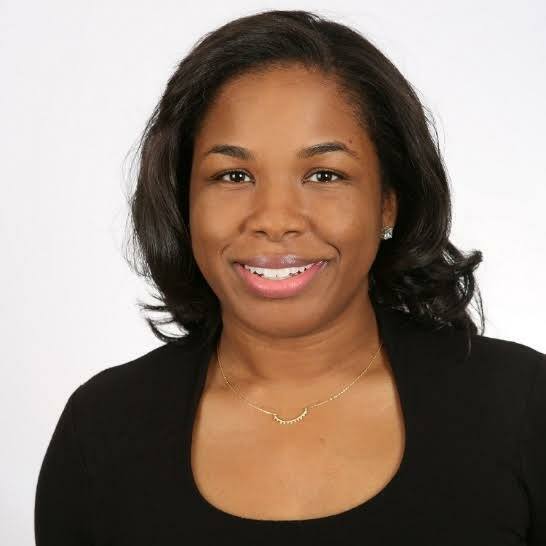 Aside from being a Member of the Hartford School Board (and a Trinity College alumna), Karen is the Program Director of the Consortium on Higher Achievement and Success, a board member at the Hartford Public Library, and a supporter of the Capital Region Education Council (CREC). A devoted mother, Karen wants to see a better future for the city that she grew up in. In 1996, the Connecticut Supreme Court found that Hartford schools were illegally segregated along racial and economic lines in the Sheff v. O’Neill case. The state was ordered to desegregate schools in the greater Hartford area. The implementation and funding of CREC magnet schools was the State of Connecticut’s response to the landmark decision. Today, however, the citizens of Hartford remain divided when it comes to the CREC magnet schools. By attending a meeting of the Hartford Board of Education and speaking with Karen Taylor we were able to see these stark divisions. At the Board of Education meeting, we witnessed passionate parents speak out against injustices as they voiced their opinions on ways in which the Hartford school system needs to be improved. These parents’ comments suggest that some in Hartford believe that magnet schools are nothing but a drain on the local school system. Karen Taylor provides another outlook – she sees magnet schools as a way to bring the greater Hartford area together. By integrating the schools in the greater Hartford area, Karen believes that the people of the region will form connections that allow them to work together to solve shared problems. In other words, magnet schools promote building what Harvard Professor Robert Putnam calls social capital. Social capital refers to the value of social interaction and trusting relationships. If the greater Hartford area is able to increase its levels of social capital, then Hartford will marshal its resources collectively to become a more prosperous city. Even two decades following the Sheff ruling, Hartford schools remain not only under-funded but also extremely segregated. While the Hartford region covers 87 square miles, the city itself is only about 18 square miles today, surrounded by more than two dozen suburban towns. In Hartford, Latinos and African-Americans comprise more than three-quarters of the population. In comparison, surrounding towns are predominantly white, as the table below comparing Hartford, West Hartford, and East Hartford indicates. The CREC magnet schools offer some children in Hartford an escape from the relatively low performing district schools in the city. CREC advertises that, in contrast to the city’s schools, a majority of CREC graduates attend post-secondary education programs. By providing students from lower income areas with the tools to succeed, magnet schools facilitate the lessening of socio-economic inequality. Moreover, by drawing children from across district lines, magnet schools bring together children and parents from different backgrounds, who may have never met otherwise. This creates a form of social capital known as bridging, which describes the growth of relationships between diverse groups of people. People like Karen Taylor hope that by bringing together people from the many different communities in the greater Hartford area, they can facilitate the creation of a more unified Hartford region. If they are able to break down the strong ethnic and socioeconomic divisions that plague the region, they will form a more cohesive community, perhaps even leading to a more even distribution of wealth. While there are a great deal of positive effects from magnet schools within Hartford, there are also a few negatives in the way the system currently is implemented. One issue is the potential damage to bonding social capital. Bonding is a form of social capital that is created by forming deeper and more meaningful relationships among people within a specific group. Though magnet schools have been able to successfully break down divisions along ethnic and economic lines and across towns in greater Hartford, they have also divided neighbors within Hartford. This division is the result of the lottery system used to determine which children can go to a magnet school. To ensure integration, placement through the lottery system factors in a student’s race or ethnicity. Magnet schools admit no more than 75% students that are Black and Latino, while Whites and Asians, referred to as “reduced isolation” students, must make up the remaining 25% of each school. This 75-25 ratio in magnet schools was mandated as a way to desegregate schools. Meanwhile, segregation persists because many Blacks and Latinos within Hartford are eager to enroll in these schools, but Whites and Asians who primarily live in the suburbs have been less interested. Blacks and Latinos are forced to wait in line for a seat, unable to enroll until more reduced isolation students decide to join them. Currently half of Hartford’s youth are in CREC schools, but some observers suggest that interest from White and Asian students may have “maxed out.” Therefore, those Black and Latino students who want a seat, but are unable to get one, are forced to go to segregated Hartford public schools. As a result of these pressures, Karen Taylor has experienced Hartford parents complaining that the system is rigged if their child is not picked by the lottery. This anger can divide neighbors along the lines of those who attend magnet schools and those who attend regular public schools. Despite these challenges, Karen Taylor sees magnet schools as an effective long-term solution to undo extreme segregation and socioeconomic disparity in greater Hartford. Magnet schools do have short-term consequences that can lead to more localized divisions among neighbors and anger from those who are unable to benefit from the lottery system. These smaller fractures within neighborhoods will slowly be healed as the greater Hartford area becomes more unified and equal. Through the early stages of the unification of Hartford, it will be rough and divisive. Having only begun to receive attention and funding as recently as 2003, the CREC schools are very much in their infancy. The process of undoing decades of segregation is a long and grueling one. While the people of Hartford will continue to try to repair bonding social capital, the responsibility for mending divides is not theirs alone. Those who live in the suburbs of Hartford should work to benefit the greater Hartford area as a whole by sending their kids to magnet schools. When more suburban students attend CREC magnet schools, it allows more children from Hartford to attend those same magnet schools. As Karen Taylor remarked, “the future is integrated.” All parts of the region will need to come together, especially the suburbs, in order for the Hartford region to create opportunities for the next generation that allow it to achieve its full potential. This article is the third in a series of four student blog posts featured from Trinity Assistant Professor Abigail Williamson's first-year seminar Civic Engagement and Community as described in my blog post Classroom to Community at Trinity. NAACP. "NAACP Legal Defense Fund : Defend, Educate, Empower." Sheff v. O'Neill | NAACP LDF. 2014. Accessed December 10, 2017. http://www.naacpldf.org/case-issue/sheff-v-oneill. Robert Putnam, Bowling Alone (New York: Simon & Schuster, 2000). Chen, Xiangming, and Nick Bacon. Confronting urban legacy: rediscovering Hartford and New England’s forgotten cities. Lanham: Lexington Books, 2015. CREC Foundation. "Open Choice Registration." CREC. 2017. Accessed November 05, 2017. Torre, Vanessa de la, and Matthew Kauffman. “As Sheff V. O'Neill Case Persists, Frustrations Grow Over Minority Students Left Out Of Magnet Schools.” Courant Community, Hartford Courant, 23 Sept. 2017, www.courant.com/community/hartford/hc-hartford-sheff-case-discrimination-claim-20170912-story.html. Kennedy, Tim. "Hartford: Integrating Schools in a Segregated Place." Teach For America. June 29, 2016. Accessed November 20, 2017. https://www.teachforamerica.org/one-day-magazine/hartford-integrating-schools-segregated-place. 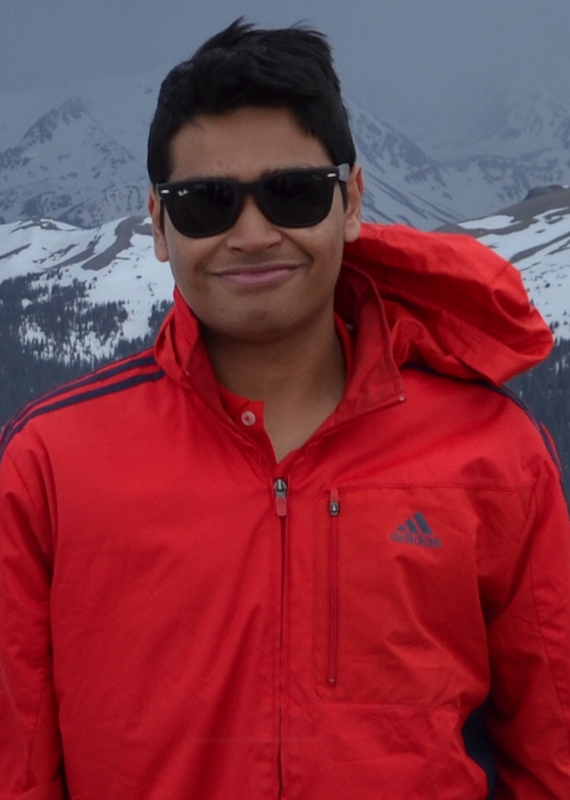 Preet Patel (Trinity College ’21) is an aspiring economics major from Belchertown Massachusetts who is looking forward to getting more involved in Hartford in the coming years. During his first semester Preet volunteered at a Hartford Habitat for Humanity build with the Trinity Campus Habitat Chapter. In the shadow of the illuminated state capitol building, hundreds of people sat mesmerized by a powerful show. Joyful laughter, sparkling smiles, and camera flashes dotted the magical landscape of Bushnell Park. Standing on stage and looking out onto people of many cultures and ethnicities, we raised and then lowered our lanterns, signifying the importance of a connected community rising through problems, and lowering barriers. Although it takes place only one night a year, Night Fall not only brings the community together, but serves as an epicenter for crossing borders, socially, economically, and ethnically, resulting in a region with greater social connectedness. Night Fall is a yearly community event held on the first Saturday in October, celebrating the rich culture, diversity and arts of Hartford through a majestic puppet performance. The show is the creative concept of lead artist, Anne Cubberly. The puppets and art featured in the show are created in conjunction with local artists and creative people of Hartford. Many of the performers and professionals in the show call Hartford home. Hartford's rich cultural communities are emphasized throughout the event. 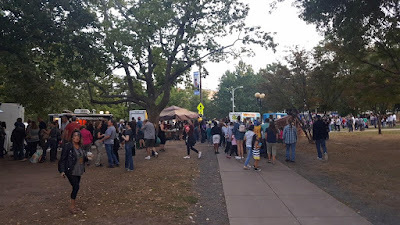 Before the show, the tempting aroma given off by the line of food trucks draws large crowds of people anxiously waiting for a delicious treat. Adults of different races, and cultures engage with one another, sparking fruitful conversations and interactions. Despite the harmony at Nightfall, Hartford has seen a decline in social capital in recent years, with important consequences. Social capital as defined by Robert Putnam, is the social interactions, networks, and trust among community members that allow for collective action. Hartford through a series of events such as deindustrialization, suburbanization, and homogeneous communities, has experienced barriers to collective action between the city and the municipalities beyond the urban core. Hartford is an often misunderstood city that has experienced extraordinary transformations throughout its history. Today Hartford is fragmented both jurisdictionally and socially, contributing to weaker social ties between community members. There is not a clear chain of events to track Hartford’s decline in social ties, but there are some factors that illuminate the problem. One factor that led to the decline of Hartford was the city’s dependence on stable manufacturing, industrial, and insurance jobs. When those industries began merging with larger corporations, moving headquarters, or shutting down, the problems for Hartford really began. The movement of high skilled workers out of Hartford created among the most racially and socioeconomically polarized regions in America. In part as a result, Hartford’s central city has among the slowest growing economies in the United States. Meanwhile greater Hartford actually ranks as among the wealthiest regions in the world. The polarization between the suburbs and the city is also clear along racial and ethnic lines. The movement of people out of the city and into suburbs created a separation of people, ideas, and cultures, increasing the ever present divide. The suburbanization of Hartford caused a profound ripple effect that led to the erosion of social capital between the city and the surrounding towns. Hartford has a disadvantage in that it has a fixed boundary, with no ability to expand. When the industrial jobs left, many high skilled workers left to the surrounding areas, because there was little growth within the city. When largely white people moved to the suburbs, they created homogeneous communities of politics, cultures, and ideals. The separation between the suburbs and the city is toxic for bridging social capital which, according to Putnam, allows people and communities to get ahead in life. The polarized communities across municipal boundaries prevent people from making social connections that offer potential for economic growth. Without bridging social capital, communities cannot benefit from sharing skills, and knowledge. 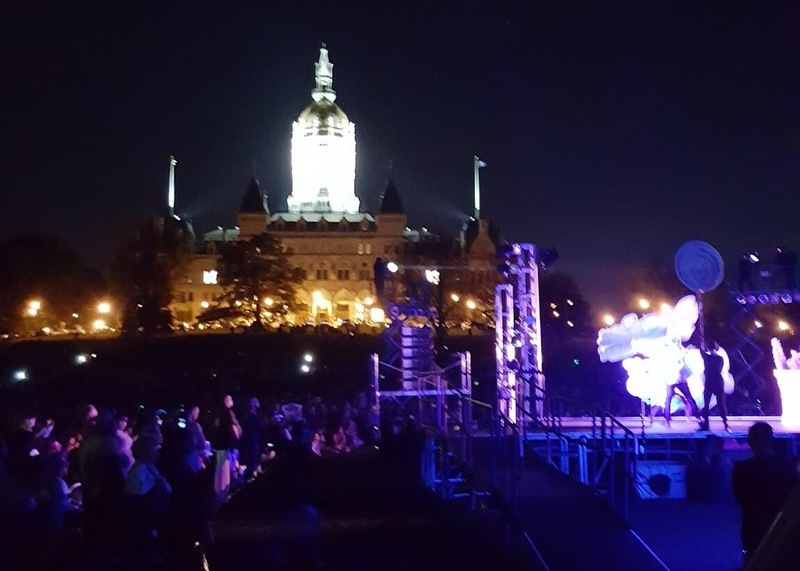 Events like Night Fall are crucial, because they promote social connection of people across different town lines, ethnicities, and cultures, encouraging stronger social networks to address Hartford’s challenges and opportunities in the future. Events like Night Fall work towards bridging social capital between the city and the surrounding towns in several ways. The food trucks with dozens of people in line force different people to interact with one another. The performers in the show are supported and are able to display their talents to the community. An audience member from West Hartford reinforced that she values Night Fall because it “increases social interaction between demographic groups.” This shared sense of culture brings the whole community together. Not only does this allow people from the suburbs to interact with people from Hartford, but it also bridges ethnic groups in Hartford. 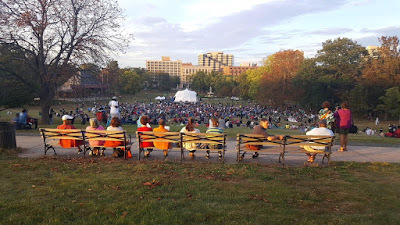 Night Fall allows these divided groups to come together and interact with one another, promoting unity and collective action among the people of Hartford and with people of greater Hartford. One of most crucial ways Night Fall increases social capital is its emphasis and work within the community. In the time leading up to Night Fall, the organization hosts artistic workshops throughout the city. In the workshops, the community is connected to the show through the creation of lanterns. Constructing the lanterns increases social capital within the community because it fosters a sense of cultural unity. The people of Hartford have a chance to showcase their culture, art, and diversity, encouraging connection to one another. Night Fall’s ability to promote diversity in the community makes it powerful tool in creating stronger social capital and consequently a tighter sense of community. In an interview with the Hartford Courant, LB Munoz, a chairwoman for Night Fall, stated: “every year we're trying to relate everything back to the neighborhood we're in. Downtown is incredibly diverse, home to people who have come from afar.” Night Fall celebrates Hartford’s diversity, and acknowledges that the city’s diversity is an asset that can propel the city past its barriers. It is clear that the people of Hartford and its surrounding suburbs have the power to transform the city. 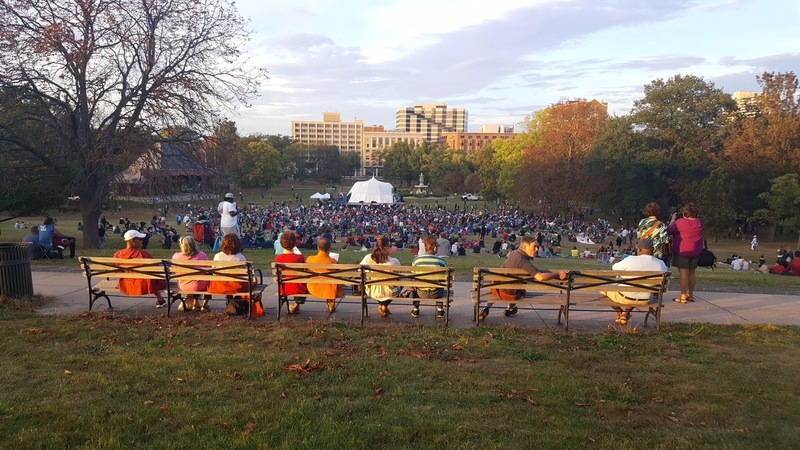 Residents in the surrounding suburbs should attend events like Night Fall, and engage with and invest in the sleeping gem that Hartford truly is. 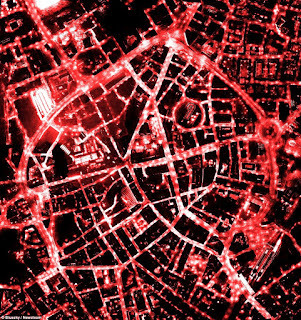 Events like Night Fall prove that interactions across barriers are possible and fruitful. If there are more social interactions between the suburbs and the city then, according to Putnam, the region will be better equipped to meet any challenge. Just as I had the opportunity to lift the lantern from Night Fall’s stage, Hartford and the surrounding towns have the opportunity to illuminate a whole new generation in greater Hartford through collective regional action. This article is the second in a series of four student blog posts featured from Trinity Assistant Professor Abigail Williamson's first-year student seminar Civic Engagement and Community as described in my blog post Classroom to Community at Trinity. 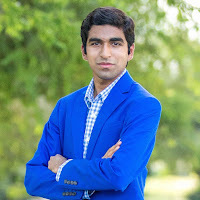 Muhammad A. Zeb is a freshman Class of 1963 Scholar from Corpus Christi, TX. He is founder of a South Texan non-profit called the Heritage Bridge Foundation, and has been selling cars since he was 16 years old. A metropolitan area is similar to a human body, wherein each city functions as a unique organ, while the central city represents the heart. The City of Hartford -- the heart of a 1.2 million person metropolitan area -- is starved of its lifeblood in a region starkly divided by income and race across municipal boundaries. These divisions present barriers to social capital in the region, reducing trust, participation, and its ability to work collectively. Activist Yanil Teron has rolled up her sleeves to reinvigorate the region’s social capital. As the executive director of the Center for Latino Progress, she recognizes that, “Hartford is truly the heart of this region.” She has dedicated her professional career to building community, especially among Latinos in Hartford. In addition to these close-knit bonding interactions, Ms. Teron further seeks to build bridging social capital across diverse groups in order to channel their energy through the veins of Hartford and its surrounding area. Historically, Hartford was synonymous with the term wealth. From manufacturing to finance to insurance, Hartford served as a hub of economic activity in the United States. Though this is not the case in the modern day, Hartford continues to possess generous traces of the resources of its glory days, such as a sizeable industrial sector. Hartford is also home to numerous higher education institutions. These institutions are a vital asset in the revival of Hartford as they nurture future citizens of the area. Instilling the importance of social capital in the students of such institutions offers a promising future for Hartford. The city of Hartford enjoys a wealth of diversity. 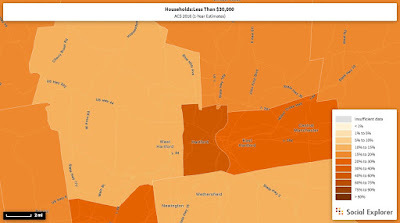 Though the existence of wealth and diversity in a region is often a positive element, diversity and wealth are polarized in greater Hartford, leaving much of the wealth in the surrounding suburbs. This departure of wealth from the city has led to a financial crisis in Hartford as the city has minimal taxable property within its 17.9 square mile jurisdiction. Furthermore, segregation and mistrust within and between the various ethnic populations of the city of Hartford are at a high level. As the largest ethnic group in the city is Latino, specifically Puerto Rican, Yanil Teron’s primary goal is to increase social capital among the Latinos of Hartford. Social capital is a vital element in a successful community since it represents the value of human networks that enable collective social action. A high level of social capital is often associated with better health, better child development, and greater safety and prosperity. The two types of social capital, bonding and bridging, are closely related and one can contribute to the other. Most recently, the Center for Latino Progress has developed the BiCi Co. program, which encourages individuals to bond over the activity of biking, through workshop courses and planned bike rides that facilitate face-to-face interactions. As Teron explained, “Our social capital plan goes beyond the professional interaction… we do fun things too.” In addition to fun, the program promotes environmental sustainability and transportation access. To further build social networks in Hartford and beyond, Ms. Teron and her organization often partner with other organizations. This fall, for instance, they participated in the Heroes and Icons Exhibit by the Arte Foundation. At this event I was given a first-hand look at how Teron’s plan of increasing greater Hartford’s social capital occurs through the force of bonding social capital. The event specifically focused on the interaction of people around their appreciation for Latino culture and heritage. The spectrum of attendance greatly varied from the Latino working class to elite members of society. I was impressed to see how a simple gathering can increase in bonding social capital. In a corner holding a plate of Puerto Rican delicacies, I saw a Latino entrepreneur giving job tips to a mom of two. Shifting my glance I saw an immigration attorney discussing policy with a state representative in the presence of a new immigrant. “This is only the first step in our plan,” Teron claimed when I expressed my awe to her. “The city of Hartford needs to bridge out to the wealthy suburbs to help greater Hartford improve,” she explained. Step 2: Pumping Social Capital through the Veins of Greater Hartford. As the map displays, Hartford is financially challenged yet its surrounding suburbs include dense pockets of wealth. Teron’s ultimate goal is to use the rebuilt heart of the region to pump social capital throughout the region, thereby connecting the financially stable to the financially marginal. “People come and go from the city every day, but they don't interact with the residents of the city. Our goal is to make these outside visitors interact with Hartford residents,” Teron elaborated. In order to accomplish this CLP is currently broadening its outreach to partner with programs like Hartford Magnet Schools and the Girl Scouts of Connecticut to increase bridging social capital. generated by Muhammad Zeb using Social Explorer. You should do something too. Yanil Teron contributes to healing Hartford’s broken heart, through bonding social capital. Now her goal is to bridge this new social capital to the greater Hartford area, thereby reinvigorating the region. As the heart of the region, Hartford will pump social capital through the veins of the greater area, and gradually return to its vibrant past. Trinity students have a responsibility to aid this progression. According to Teron, “Trinity students must branch out of their homework assignments, and get out in the community,” in order to build bridging and bonding social capital. So the next time your friends decide to order food delivery, advise them to go out to a restaurant. Building social capital is an enjoyable process, and we have already made strides in the right direction, thanks to the efforts of Yanil Teron and other Hartford leaders. 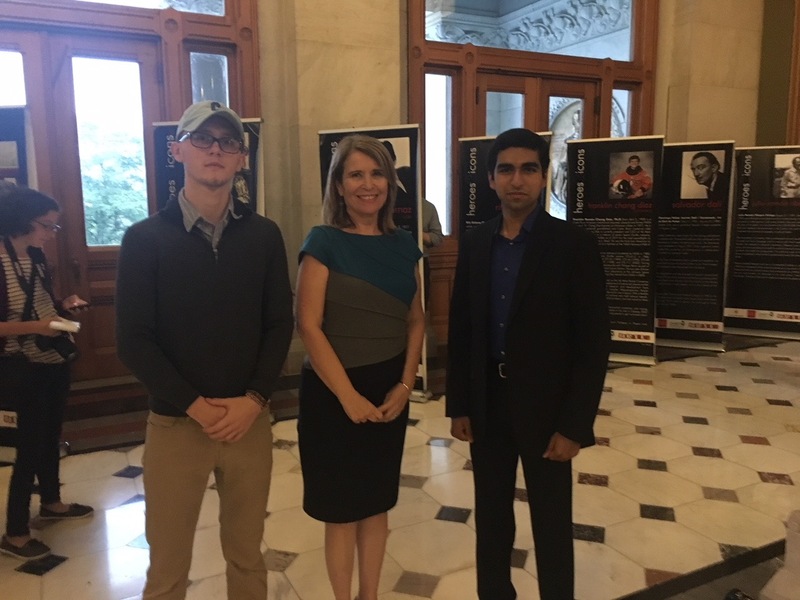 Muhammad Zeb's article is the first in a series of four student blog posts featured from Trinity Assistant Professor Abigail Williamson's first-year student seminar Civic Engagement and Community as described in my blog post Classroom to Community at Trinity. Photos and graphics submitted by Muhammad Zeb.